Why Did Warren Buffett Sell $700 Million in Oil Stocks? Berkshire Hathaway sold all of its shares in midstream giant Phillips 66, and equipment maker and service provider National Oilwell Varco last quarter. What gives? Why's Warren smiling? Because he knows something you don't. Source: The Motley Fool. Berkshire Hathaway (NYSE:BRK-A)(NYSE:BRK-B) CEO and world-beating investor Warren Buffett's every move is followed closely by investors. Whether it's looking for trends, opportunities to emulate the Oracle of Omaha, or even for signs that his decades of success are coming to an end, every new 13F that Berkshire files each quarter gets endless scrutiny. As a longtime admirer of Buffett and someone who follows the energy market closely, I was interested to note that Berkshire sold off all of its stake in two giants in the oil patch last quarter, Phillips 66 (NYSE:PSX) and National Oilwell Varco (NYSE:NOV), worth around $700 million combined based on average prices during the quarter. Is Uncle Warren giving up on oil, or is there something else going on? Let's take a closer look. For the most part, Berkshire's stake in Phillips 66 wasn't intentional, but was a stock dividend for ConocoPhillips shareholders when Phillips 66 was spun off as a separate company in 2012. Since then, with a few exceptions in recent quarters when small quantities of shares were acquired, Berkshire's position in the midstream giant has been steadily getting smaller. For context, Berkshire held more than 27 million shares as of June 30 2013, worth more than $1.7 billion at the time. This past quarter, that had dwindled to less than 7.5 million shares, valued at $600 million. Berkshire has similarly been thinning its holding of NOV, as the company is known, since summer of 2013, when its position peaked at 8.9 million shares. However, Berkshire has retained the shares of NOW, the former distribution subsidiary of NOV that was spun off last year. At the end of June, Berkshire's 1.8 million-share stake in NOW Inc was worth around $29 million, a mere drop in the $108 billion bucket that is Berkshire's stock portfolio. The interesting thing about these two companies that might make it hard to understand why Berkshire would have sold is that both Phillips 66 and National Oilwell Varco are two of the best in their respective industries. 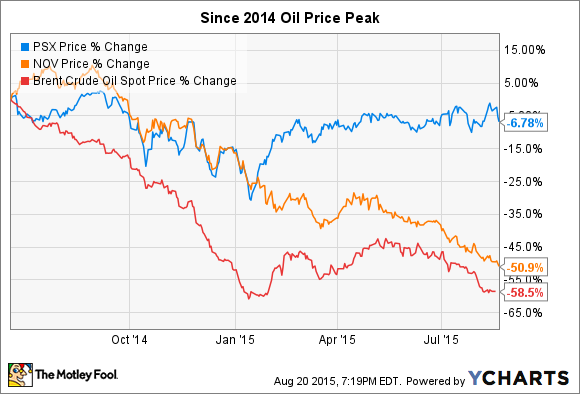 Furthermore, oil prices don't really directly affect these two companies the way it does oil producers. Yes -- NOV will feel the pinch from the massive reduction in drilling activity -- there are less than half as many drilling rigs operating in North America now as last year -- and eventually, "No Other Vendor" will benefit in a big way when drilling activity picks back up. The company recently reported that pricing is stabilizing, an indication that demand for its parts, products, and services is beginning to recover, so we may already be past the worst for the company. As to Phillips 66, it can actually benefit from cheap oil and gas, because those products are inputs in its manufacturing and refining businesses, lowering its manufacturing costs. Either way, it seems strange -- in isolation -- for Berkshire to have exited these two stocks at what might turn out to have been close to the bottom. These stock sales actually fly in the face of one of Buffett's most popular quotes: "Be fearful when others are greedy, and greedy when others are fearful. It's that simple." If it's that simple, then why did Buffett sell in the middle of the downturn -- what may be the worst time to sell? Most likely it was simply opportunity cost. Since March, Berkshire has ponied up for more than $47 billion in acquisitions. This spring, the company spent $10 billion to help fund the Kraft Heinz Company merger, combining publicly held Kraft with Heinz, co-owned by Berkshire and 3G Capital. More recently, Berkshire announced its largest-ever acquisition, spending $37.2 billion in cash and debt to buy Precision Castparts. In other words, there's a high likelihood that it wasn't so much a negative sentiment toward these two companies as it was putting the cash to use somewhere else. During the past decade, a larger and larger portion of Berkshire's excess cash has been put to work buying whole businesses, and that's likely to be the case going forward. The reality is, the company has gotten so large that investing in stocks just doesn't move the needle like buying a whole business does. Think about it this way: Since its 2009 acquisition of BNSF Railways, Berkshire has spent more than $100 billion to acquire either whole or partial stakes in entire businesses. As a comparison, the company's equity portfolio grew from $56 billion to $115 billion. That's almost twice as much invested in acquisitions, versus buying stocks or stock gains. I get it -- emulating Buffett is laudable. But there's a big difference between learning from his actions versus just copying them. This is doubly important when his objectives -- in this case potentially raising cash for an acquisition -- aren't aligned with your own. With that in mind, it's probably the right time to be acting counter to Buffett, and taking a hard look at buying these two companies. If Buffett wasn't looking to buy the whole store, these are exactly the kinds of top-notch businesses he'd be shopping for on the bargain aisle today.